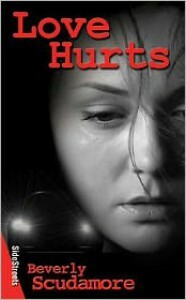 Love Hurts is a quick but weighty story. Ultimately I wish it were longer, and the characters and the events would have been more fleshed out. I liked Mel, the main character, she was smart and a typical ya narrator. Though the writing felt off at times, like it was more of an essay or something rather than a flowing narrative of events like I am used to. It just brought me out some of the language that seemed too adult or formal. Overall though, I liked her voice and her story. I am not sure if the point was that Mel realized there were issues with Colter earlier and tried to get herself out before the typical time that it happens in books with abusive or negative relationships, or that the crescendo just wasn't as fleshed out as it could have been. I did like the clues and "mystery" surrounding Jillian, his previous girlfriend though it made it easy for me to spot what the eventual outcome would be. The secondary characters were interesting. I liked that it had diversity with being not from the USA, and with Dustin being on the reserve. The chemistry and build up between Mel and Dustin was actually one of my favorite parts to the story and I never really fell for Colter, which I think is usually an element present in abuse stories, because then we see what the narrator sees in him, and why it can be harder to give them up, which is how it goes in real life lots of time though. But I really appreciated the courage that Mel had, and that she didn't isolate. Although she hid some of her doubts and questions about Colter, she also shared a lot more than most do, and that is important model for girls and women to see and hope that they could do and stand up for themselves in a negative relationship. I also wished for more with the ending. Sometimes I think that open endings are perfect, but it just didn't quite do it for me with this one. Bottom Line: Important topic with good narrator but needed more to the story.